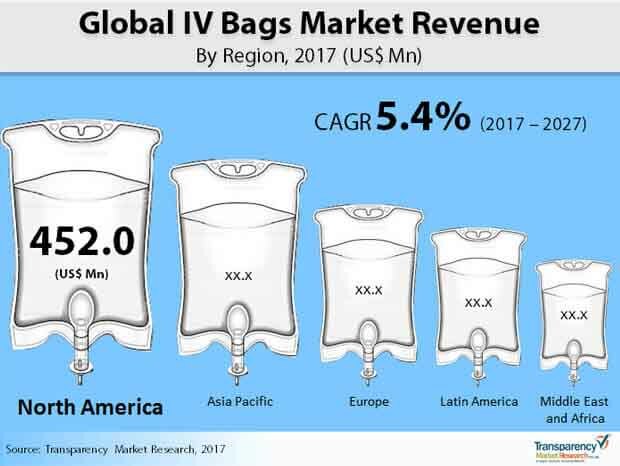 The global market for IV bags features a largely fragmented and competitive vendor landscape owing to the presence of a large number of companies, observes Transparency Market Research in a recent report. Companies keen on expanding their consumer bases and gaining a larger hold on the market are focused on geographical expansion, strategic collaborations with promising regional companies, and R&D activities aimed at the development of new and more reliable product varieties. Focus on the development of products made from environment friendly and biologically harmless materials has also increased as stringent environment-protection and patient safety norms keep rising in numbers across the globe. Some of the leading companies in the market are Haemotronic S.p.A, B.Braun Melsungen AG, Wipak Group, Baxter international Inc., Sippex, Renolit Solmed, and West Pharmaceutical Services Inc. According to the report, the global IV bags market is expected to exhibit a promising 5.4% CAGR from 2017 to 2027, rising from a valuation of US$1,363.8 mn in 2017 to a revenue opportunity of US$2,316.5 mn by 2027. Based on material, the PP segment presently holds the dominant share in the market owing to the material’s non-reactive and inert nature. Geographically, the market in North America is presently the leading regional market in terms of growth prospects and revenue opportunity. One of thy growth drivers for the global IV bags market is the high use of injections for delivering drugs, liquid substances, and other nutritional products directly in the bodies of patients who have difficulties swallowing anything. The ease of use, easy availability, low costs, and availability in a variety of types based on materials and price ranges make IV bags one of the key components of parenteral nutrition procedures where these bags are often used to administer a variety of compounds such as amino acids to patients. The market is also steadily expanding owing to the vast rise in prevalence of a number of chronic diseases requiring patient admissions to hospitals or other healthcare centers and the rising global population of geriatric, a demographic that is highly susceptible to a number of health conditions. Old people are also susceptible to a number of health conditions that impair their ability to consume vital nutrients or drugs orally, requiring IV bags for administering the same. Higher accuracy and quicker results associated with IV bags as compared to consuming drugs orally also work in the market’s favor. The growth prospects of the global IV bags market are hindered by a certain degree owing to concerns associated with the potential risk chemical leaching from IV bags made of PVC material. This potential risk translates to the risk of accidently supplying toxins to the patient in the process of delivering the contents of the IV bag. Owing to these concerns, the market for IV bags remains under scrutiny and manufacturers are required to spend vast resources on ensuring safety of their products and also getting them certified from healthcare certification bodies. Nevertheless, the rising focus of manufacturers on R&D activities aimed at the development of environment-friendly and biologically safer materials that do not release toxic products could help the market work its way through the challenge. Focus has also increased on the development of products with multiple compartments, capable of minimizing the steps required for administering drugs and reducing the risk of entry of pathogens in the blood stream, sepsis, and contamination.